Click the question to view the answer. If your question isn't answered here, please contact us. How do I install my SkyBell? Download the SkyBell HD app from the app store and watch the video for full instructions. Please visit our support page for additional resources to help you install your SkyBell. We will continue adding more phone models to this list of optimized devices. To find the SkyBell Android app in the Google Play Store, search “SkyBell”. Does it require power? What is the setup? Yes. SkyBell requires full time power from a low voltage transformer and is compatible with secondary power from 10-36 VAC 10 VA. SkyBell also requires connection to a wired doorbell chime. Simply remove your old doorbell button and attach the two wires to SkyBell (assuming your power setup is correct and you have a wired doorbell chime). You will still hear the home doorbell chime in the house. 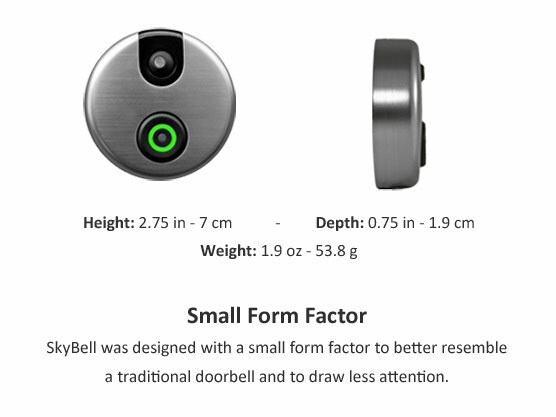 SkyBell is only designed to work with a low voltage transformer and wired doorbell (mechanical or digital with adapter). The primary power standard to the transformer can be 120/130 VAC or 220/230/240 VAC. 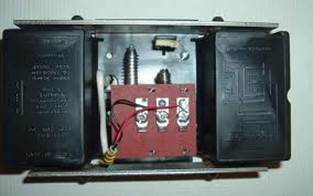 The secondary power from the transformer to SkyBell must be 10-36 VAC 10VA. WARNING: DO NOT CONNECT BOTH WIRES OF SKYBELL TO A TRANSFORMER, VDC POWER SUPPLY OR OTHER POWER SOURCE WITHOUT EITHER (A) WIRED DOORBELL CHIME OR (B) 10 OHM/10 WATT RESISTOR. IF YOU INSTALL SKYBELL WITHOUT A WIRED DOORBELL CHIME, YOU MUST USE A 10 OHM/10 WATT RESISTOR BETWEEN ONE CONNECTION TO SKYBELL FROM THE POWER SOURCE. FAILURE TO DO THIS CAN DAMAGE SKYBELL AND WILL AUTOMATICALLY VOID YOUR WARRANTY. TO SEE THE POWER DIAGRAMS, VISIT OUR POWER SECTION FOR MORE DETAILS. Do I need an existing doorbell? See Power Setup FAQ for more details. Direct power from low voltage transformer. SkyBell is only designed to work with your current doorbell’s low voltage transformer. The primary power standard to the transformer can be 120/130 VAC or 220/230/240 VAC. The secondary power from the transformer to SkyBell must be 10-36 VAC 10 VA. SkyBell can work with a 12 VDC power supply but you MUST use a 10ohm/10watt resistor on one connection between SkyBell and your power supply. Failure to do so will damage your SkyBell and automatically void your warranty.Do not connect both wires of SkyBell to a transformer or power supply without either a wired doorbell chime in series or a resistor. If you DO NOT use a doorbell chime, a 10 ohm / 10 watt resistor MUST BE USED between one connection of SkyBell and the power source. 2.4 Ghz WiFi Connection with full time internet. SkyBell requires a 2.4 Ghz wireless router connection with its own SSID. SkyBell will not work on a 5 Ghz wireless standard at this time. If you have a dual-band router, be sure to segregate your wireless channels and connect SkyBell to the 2.4ghz channel.SkyBell also requires that N-only routers be set to b/g or b/g/n settings and not “N-Only”.SkyBell works best on the 20 MHz bandwidth and with WPA security settings. 1.5 mbps Wi-Fi Upload Speed. For SkyBell to work at its best, we recommend that the SkyBell be placed in an area that receives a good Wi-Fi signal that allows for at least 1.5 mbps upload speeds and 1mbps download speeds. If you do not have enough Wi-Fi signal strength, you can move your router closer to your door or purchase a Wi-Fi range extender. Click the link to see the range extender we recommend. To check your network’s upload speed, please follow the instructions on this page: Speed Test. Wired Doorbell Chime SkyBell works with mechanical and digital doorbell chimes. A mechanical doorbell chime does not require any additional effort. A digital doorbell chime requires the SkyBell Digital Doorbell Adapter, which may be sold separately. The only way to know for sure if you have a mechanical door chime is through visual inspection. A mechanical doorbell chime looks like the picture below. At this time, SkyBell is not compatible with wireless doorbell chimes or intercom systems.Click the link to see a list of door chimes we recommend to use with SkyBell. What if my SkyBell gets stolen? SkyBell incorporates a number of theft prevention tactics to help keep your SkyBell on your wall. First, the set screw is proprietary and it cannot be accessed with pliers because it is not exposed. Second, SkyBell’s mount will not work if it is forcibly removed from the wall. Third, we can remove the device from the server, preventing it from being added to another account. Lastly, SkyBell has an active motion sensor and can alert you within seconds of someone attempting to steal your SkyBell. You can snap their photo and just tell them you’re calling the cops. While theft is extremely unlikely (and has yet to happen with tens of thousands of customers), we still offer a theft replacement guarantee. If your SkyBell is stolen, we will replace it free of charge. To be eligible for our theft replacement guarantee you must have purchased your SkyBell from an authorized SkyBell reseller. You must also provide us with proof of purchase and a police report. Guarantee valid only in the continental United States. You will be billed $19.95 for shipping and handling. What if someone knocks on my door? If you have the SkyBell motion sensor activated, you’ll receive an alert and video feed if someone is at your door for more than 10 seconds. You can also start the audio and video feed from your SkyBell by opening the app and activating the “on-demand” feature. Will SkyBell let me know if someone is at my door when I am away from home? Absolutely. As long as you have cellular or WiFi connection, you can see who’s at your front door from just about anywhere in the world. Can I turn off the doorbell in my house and only receive alerts on my mobile device? Yes. We call this Silent Mode. This is found in the individual device settings area of the app. You can disable and enable your traditional home doorbell chime at any time. What happens to my home doorbell sound? If you have a wired doorbell, you will still hear the traditional doorbell sound in your home. SkyBell only replaces the doorbell button and you can still enjoy your home’s doorbell chime. SkyBell’s Silent Mode allows you to turn your home’s doorbell chime on or off from the app. This is found in the individual device settings area of the app. How many people can be connected to my SkyBell? As many as you like – there’s no limit. As long as everybody has a compatible mobile device, each user can receive the alert and one user can “answer” the live video feed. I don’t own a mobile device, can I still use SkyBell with a computer? At this time, SkyBell is not compatible with a computer. Support for Windows and Mac is coming soon. How do I remove somebody from my SkyBell account? At this time multiple users is managed by allowing another user to use your login credentials to also receive your feed. You can remove them by creating a new password. We plan to develop a limited user capability in the future. What happens if I get a new smartphone or tablet? If you get a new mobile device, just download our app and log into to your account using your username (which is your email address) and your password. How will I know if I synced my SkyBell properly? Your SkyBell is designed to be self-diagnostic. Once the SkyBell is installed, the doorbell button should turn green to indicate a successful connection with your WiFi Router. If the doorbell button turns red, it means that SkyBell was unable to connect with your Wi-Fi network. Relaunch the App and go to device settings to reconnect to your Wi-Fi network. Once you successfully sync once, you do not need to re-sync or delete your SkyBell for any reason. What happens if my WiFi stops working? In the event you lose WiFi connectivity, your home’s doorbell chime will still work if you have a wired, analog doorbell. If my mobile devices run out of battery, will my regular doorbell still work? Yes. Your home’s doorbell sound will operate normally (only compatible with a wired doorbell chime). If I move, can I take my SkyBell with me? Yes, SkyBell is designed to be both secure and movable. Your SkyBell device is linked to your SkyBell account. If you move, SkyBell can move with you. What happens if I get a new WiFi Router? After you’ve plugged in your new WiFi Router, open the SkyBell App and go to the device settings for your SkyBell. You’ll need to delete your existing device and restart the Wi-Fi syncing process with the new router. Can I use 2 or more SkyBell’s on my house? Also, you can have multiple devices on different houses or locations. For example, you could have “My Home” and “Grandma’s House”. Can I remove the device after installation? Does SkyBell work without internet? No. 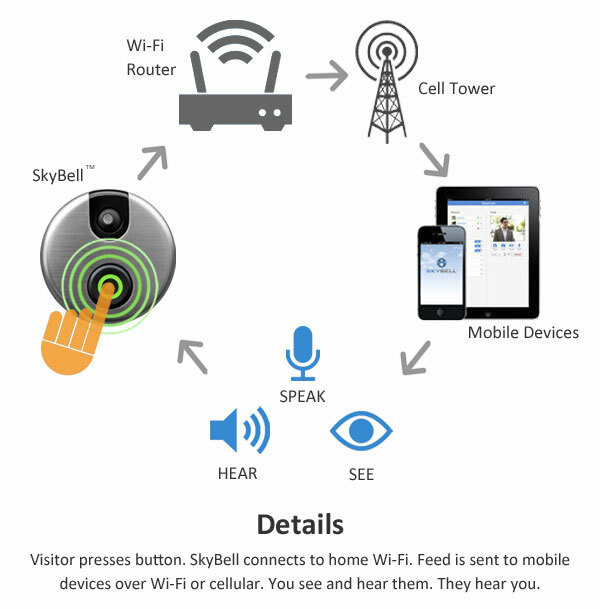 SkyBell requires full time access to the internet and will not work without it. SkyBell connects to your home’s wireless networks (2.4 ghz only) and is compatible with B/G/N wireless networks. Does SkyBell work with a wireless doorbell? No. SkyBell only works with mechanical and digital doorbell chimes. SkyBell does not work with wireless doorbells, intercom systems or integrated video systems. Can I see the live video feed even if a visitor doesn’t press the button? Yes, SkyBell is the only video doorbell with a motion sensor which will activate your SkyBell when a visitor is at your door for 10 seconds. SkyBell is also the only video doorbell that allows you to open the live video feed by using the “On-Demand” feature from within the SkyBell app. What are the motion sensor features? SkyBell is the most advanced WiFi doorbell available and the motion sensor is a big reason why. We’re developing features that will allow the device to start calls, snap pictures and send alerts based on motion detection, even without a visitor pressing the button. We are considering a desktop version and do not have a release date for desktop clients. Will there be a Windows Mobile App? Not at this time. We are considering development for Windows Mobile platform in the future. Please check back with us for updates. Can I unlock my door? At this time, SkyBell cannot unlock your door unless you have a smart lock and the smart lock is on the same platform as SkyBell, and the unlock commands exist. Can SkyBell integrate with my current intercom? Are there APIs or IP addresses for integration with apps, other devices or desktop clients? Not at this time, yet we are considering all these options. Does SkyBell integrate with other 3rd party applications and devices? SkyBell HD will work with some of the best platforms in IoT. What is the camera’s field of view, resolution and frames per second? 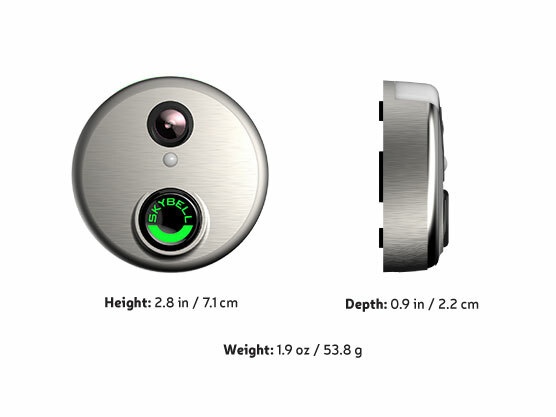 SkyBell’s camera covers 120-130 degrees field of view. The video resolution is 640×480. The frames per second (fps) will depend on your connection speeds. SkyBell is designed to automatically scale the fps to better prevent a dropped connections. SkyBell HD Specs: Camera: 1080p HD Video: H264 x 30FPS HD 180 degree field of view Full color night vision up to 15ft. Is my SkyBell water proof? Yes. SkyBell is designed to work in harsh environments including heat, rain, snow and humidity. The device is sealed with special coating to keep it safe from the elements. Is there a backup battery? There is an internal battery that serves to regulate power and provide consistent power for SkyBell’s advanced features. SkyBell HD has a built in battery used for power regulation. What are the power and voltage details? Voltage 120/1130v AC, or 220/230/240v AC Transformer Range: 8-36v AC, 8-15 VA Low Voltage Transformer(UK/Europe) 8-36v AC, 1 AMP 8-15 VA.
How can I check my power voltage? You can use a standard volt meter to check the voltage coming from the wires at your front door. The voltage should measure between 10-36 VAC 10 VA. If your voltage is less than 12VAC, we recommend you change your home’s transformer. Click to see a list of approved transformers. Which WiFi formats is SkyBell compatible? SkyBell is designed to work best with B, G and N wireless network formats. SkyBell only works with the 2.4 ghz band. If you have a dual-band router, you must segregate the 2.4ghz band and create a unique SSID for the 2.4 ghz network. If you have an “n-only” router, you must switch the setting so that the router is set to b/g/n. How strong is the WiFi signal and how can I test it? The actual range will depend on the strength of your router and the walls/materials of your home. In almost all cases, SkyBell will require 1.5 mbps upload speed. Please note that your connection upload speed needs to be fast enough to upload video from SkyBell. Click the link to see how to do a Speed Test. How can I tell if the Wi-Fi signal is strong enough at my front door? Your SkyBell requires a minimum Wi-Fi strength of 1.5 mbps upload and 1.5 mbps download to function optimally. You can test the Wi-Fi signal at your door by following the steps on this page: Speed test instructions. Make sure the door to your home is closed when your run the test. SkyBell is the only Wi-Fi video doorbell that can operate below 0 degrees. The device operates from -40 to 150 degrees Fahrenheit (-40 to 65 degrees Celsius). This is due to the fact that there is no removable battery, SkyBell’s superior build quality and being Made in the USA. SkyBell HD operating temperature: -40 degrees F to 140 degrees F (-40c to 60c). For SkyBell HD, please download the SkyBell HD app and follow the steps in the app. For additional troubleshooting, visit our support section. Can I adjust the camera after I’ve installed the SkyBell? No, SkyBell HD has a wide-angled, HD lens for the best monitoring and security. My doorbell is on a door frame or I don’t have a lot of space. What can I do? At this time, only SkyBell 2.0 has a compatible door frame adapter. SkyBell HD cannot be mounted to a door frame narrower than 3 inches. Will SkyBell work outside the USA? Yes. You can buy an SkyBell for use outside of the USA. US customers will be able to receive alerts and communicate with their visitors while traveling abroad. Be sure to check with your wireless service provider to see if additional rates or fees will apply. SkyBell also works for homes outside the USA. Yes. International orders can be made from our Website Product Page. International orders are only available in select countries. How can I buy an SkyBell? SkyBell us currently for sale at: jp.skybell.com, amazon.com, select Best Buy stores, BestBuy.com and HomeDepot.com. Can I return my SkyBell? You can return your SkyBell if you purchased from us or one of our authorized resellers and a refund is applicable per our full return policy. We offer a 30-day money back return policy for orders made on our website. Shipping, handling and a $30 restocking fee will be deducted from your refund amount. Returns will be processed in 7-10 business days. International orders (not including Canada) are final and cannot be returned or exchanged. To see our entire refund policy, read the terms and conditions found on our legal page. If you purchased SkyBell from an authorized reseller, you are subject to their return policy. To initiate a refund and to arrange for the return of the product, please create a customer service ticket. To see our entire refund policy, view or terms and conditions found on our legal page. What is the SkyBell Warranty? SkyBell comes with a 1 year limited manufacturer’s warranty. If your SkyBell is defective, contact customer service and we will assist you with the return process. To review our warranty policy in its entirety, visit our legal page. Can I cancel my SkyBell order? Per IndieGoGo’s policy, there are no cancellations or refunds for contributions made during the IndieGoGo campaign. All cancellation refunds will be paid net of any expenses incurred by SkyBell Technologies and could take up to 10 business days for processing. SkyBellはSkyBell Technologies, Inc. の商標です。本サイトは米国ならびに国際的に著作権法及び商標法により保護されています。許可なく複製・改変することを禁止します。また、Skybellは特許により保護されています。Copyright © 2019 SkyBell Technologies, Inc. All rights reserved.